Today I rode my Fox Lake Loop route. 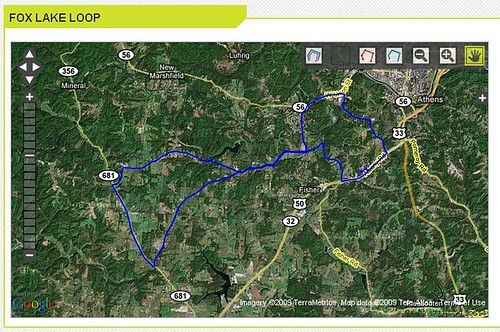 21.87 miles in 1 hour 28 mins. 551m (1870 feet) of climbing, according to Sanoodi. The ride was great. This was my first ride not on the bike path this year, and it felt truly awesome. I’ve done this route serveral times last year, so I am very familiar with it. I have to say that while this is only my 7th ride of the year, I felt stronger on this ride than I have in the past. I was able to go a bit faster, and muscle over some of the hills in a harder gear. I only had to use the 32 tooth cog once, and that was on the last hill of the day. I’m really excited that some of the conditioning that I’ve been doing over the winter seems to have had some effect. It’s really encouraging that I’m in decent shape this early in the spring, and I don’t think I’ll have much trouble doing the 45 mile leg of the Tour de Forest on Saturday. Now to lose the 10 pounds I gained back from last summer, and I’ll be flying.